This is a NEW Genuine SKY RC ARES PRO 4.0T 8350KV MODIFIED 540 SENSORED BRUSHLESS MOTOR. •Compatible with any Sensored/ Sensorless ESC. RC Cars & Trucks. Nine Eagle Solo Pro. Engine Parts. RC Helicopters. Trinity Revtech 13.5T HYBRID 24K / Kill Shot Sensored Brushless Motor 100% NEW! This is a HYBRID Revtech 24K / Kill Shot Sensored Brushless Motor. TRINITY / REVTECH. Revtech Kill Shot 13.5t R Stator. Revtech 24K Build Kit. 24K Motor Rebuild Kit 24K Gold End Plates (sensor board and pinion side plates). The G46 (50-55) brushless out-runner motor can replace a. 46-.55 two stroke nitro engines. It is equivalent to AXI 4120 and E-Flite Power 46. It is capable of producing up to 9 lb of thrust and generate about 1000W of power. This is a new Velineon 3500 Brushless Motor and ESC 3350R G reat for the Traxxas Rustler, Bandit, Slash, Emaxx and MORE! This Motor and ESC Includes hardware as shown in the pictures. Part numbers are for reference only. It does not include sensor cable. The G60 (50-65) brushless out-runner motor can replace a. 60-.75 two stroke nitro engines. It is equivalent to AXI 4130 and E-Flite Power 60. It is capable of producing up to 10lb of thrust and generate about 1200W of power. RC Car Electric Brushless. Specification Sensored SC120A ESC. Ending Soon. Video will open in a new window. Spare Parts (Hecliopter). Suitable（ESC） TORO SC120A ESC. Hand Wound Y. Thermal Protection Y.
Powerhobby Aluminum Motor Heatsink Cooling Fan For 1/10 540 / 550Size Brushed / Brushless Motor. Keep your temperatures in check and your motor running efficient and cool with our Motor Heatsink with Twin Cooling Fan. Motor Parts. Hard-Case Lipo Plug Harnesses. Hard-Case Lipos. Lipo-Safe Charging Bags. 32DP, 5.0mm. 32DP, 3.2mm. ~ 1/5th BL Motor, 800Kv, 8mm shaft: DYNS1665. 70mm can with recessed fins is also a great fit in boat and EDF applications. Motor Parts. Car Motors. 1/10 Truck Tires/Wheels. 4-pole motor with 12-slot high-torque design. Servo Connectors/Pl​ugs. Connectors/Plu​gs. Surpass Hobby USA | Rocket V4S ROAR SPEC 17.5T Sensored Brushless Motor NEW!!! Rocket V4S ROAR SPEC 17.5T Sensored Brushless Motor Red/Black. 17.5T ROCKET V4S. Sensored Brushless Motor. 540 Sensored Brushless Motor Design with Dual Sensor Ports. ROAR Approved, BRCA Approved, EFRA Approved. Rebuildable design with all spare parts available from Maclan Racing. The MX540 is a 36mm x 50mm 540 class motor with 3.17mm motor shaft. It supports all 1/10 2WD applications, 2WD buggy, 2WD stadium truck, and 2WD SC. This is a NEW Genuine HOBBYWING EZRUN Max10 SCT ESC / 3660 SL Brushless 4000KV G2 Motor : 1:10 4WD. 1 x Ezrun Max10 SCT ESC. 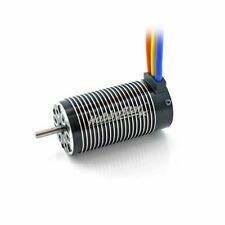 1 x Ezrun 3660 SL brushless motor. Monster truck (4WD). Nine Eagle Solo Pro. 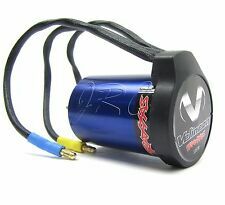 1/10 Traxxas Velineon 3500kv VXL Brushless 4-Pole Motor, model # 3351R. For use with vxl esc 3355R. Velineon 3500 Features. This was removed from a NEW Traxxas vehicle. Great for many r/c vehicles like the 1/10 Stampede, Rustler, Bandit, Slash, and more. Holmes Hobbies Trailmaster Pro 540 Brushless / Sensored Crawler Motor 3800KV. Condition is New. Shipped with USPS First Class Package. Opened box for pictures. Include sensor wire. Thanks for looking. NeoDym 2826 KV1350 OUTRUNNER BRUSHLESS MOTOR. 1 xN2826 KV1350 outrunner brushless motor with acc. Motor: N2826. 3D or Unlimited: 15 oz. = 425.243gram. Aerobatic: 22 oz. = 623.69 gram. Trainer: 30 oz. AXE540 Motor w/ XeRun ESC FOC System, Combo (2300kv). It can work smoothly at low speeds. This greatly improves the maneuverability of rock crawlers at low speeds. allows users to read ESC data or update ESC firmware via a smartphone (installed with the HW LINK app). Trinity 17.5 1s Maxzilla Brushless Motor, never been used. Won at a raffle and have no use for it. No sensor wire was included. REVTECH. POWER Yourself to the NEXT Level. 2100Kv this number is approximate set as Zero Degrees of Timing. Standard Race SPEC Features Revolutionary timing ring & locking end plate systems saves weight Only 6 short screws (no long screws). 9100Kv this number is approximate set as Zero Degrees of Timing. ROAR 3.5t Drag Racing Modified Brushless Motor. Monster Horsepower Series is all new! Thermal Stator Coating for the best heat dissipation possible. Sensored:Yes (Standard 6 pin harness). Featuring a quality CNC alloy motor can, hand-wound high purity copper windings and powerful sintered neodymium magnets, you wont find a better priced motor of this caliber anywhere else! STUBBY 2 2 0 0 K V. High Power. High Torque. High Performance. "Stubby" length! Perfectly suited as a drop in motor for most 2 or 4WD trucks that use 540 size motors, don't let the small size fool you. I bought it from HobbyKing for an electric skateboard project that I ended up not doing, so the motor is practically new other than being mounted in the cage. 3.3 Built-in temperature sensor. 4.2 The timing of 3.5T and 4.5T motor can be steplessly adjusted by turning the rear panel. 165 fixed timing. 3.2 Dustproof design. Copper wires of high temperature endurance. Motor Parts. Car Motors. 1/10 Truck Tires/Wheels. Hard-Case Lipo Plug Harnesses. Hard-Case Lipos. Lipo-Safe Charging Bags. 32DP, 5.0mm. 32DP, 3.2mm. Monster Horsepower Series is all new! 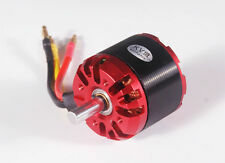 ROAR 3.5t Modified Brushless Motor. New Short Stack Stator Design. Certified Gauge High Temperature Wire. New 220C wire coating. More Vents for More Cooling. Thermal Stator Coating for the best heat dissipation possible. Motiv 13.5 Brushless Motor. Motor is used and in good condition. Sold as is. Any questions please ask. See my other listings. (1) BL Motor Wire Set. This is a set of three pre-tinned 4 mm motor wires (blue, yellow, and orange) with bullet connectors. Note: Picture is for illustrative purposes only. Actual product may vary. Castle Creations 1410 1Y 4-Pole Sensored Brushless Motor (3800kV). When paired with a Castle Creations sensor supported ESC, like the MAMBA MICRO X, MAMBA MAX PRO or MAMBA MONSTER X, you can unlock advanced tuning capabilities that Castle Link provides specifically for sensored motors. 4500KV Motor Brushless x1. Brushless 35A Waterproof ESC x1. Spare part compatible for LC Racing Kits. Motor Specifics. Ideal for 1/14, 1/16 DIY custom project. R1 WURKS 17.5T MOTOR. R1 V21 STATORS ARE DESIGNED USING COMPUTER SIMULATION TECHNOLOGY. PROPRIETARY R1 STATOR LAMINATE MATERIAL. EPOXY BONDED END WIND. OVAL 1S OPEN (BOOSTED). I've got 35 years in this hobby and it was never run hot. Great used Fantom 25.5T motor. This Updated 3351r 4 pole Motor will not work with older model 3355X ESC. 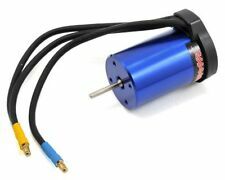 HobbyStar 3660 4-pole brushless motor provides increased torque when compared to a standard 3650 while still providing top-end power. Motor Parts. Car Motors. 1/10 Truck Tires/Wheels. 4-pole motor with 12-slot high-torque design.